You have found a great deal online. A car that has everything you wanted and selling for well below a few thousand dollars than the market price. The description is compelling and the photos alluring. However, that vehicle that you thought was perfect may have a salvage title. How to know for certain? One way is to purchase a Vehicle History Report for $10.00. While we do recommend getting one from our partner before your purchase, there is another option for you to consider. 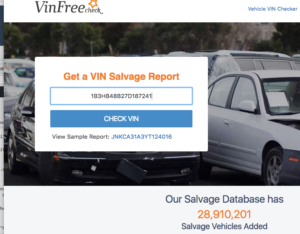 At VinFreeCheck, we collect salvage or junk information and we have built a salvage title checker around it. Best of all, we offer it for free. We will demonstrate the process of performing a salvage check on our site using a real example we encountered ourselves. We were looking for a car and found a car advertisement at cars.com. You can always find the VIN for the vehicle on Vehicle Details at cars.com on the vehicle details page. Other sites or classified ads may display VIN at different locations. However, locating the VIN should be your first step. The next step is to enter the VIN in our Salvage Checker. In this example, we are going to enter the VIN obtained from cars.com in our Salvage Checker form. The VIN is 1B3HB48B27D187241. If you have followed along, you will be presented with neatly laid out details for the vehicle. We are interested specifically in the Junk/Salvage Report section. Interestingly enough, we can see that the vehicle actually has a Salvage Title (WA – CERT OF TITLE-SALVAGE)! This seller failed to disclose this important information upfront in the advertisement. This salvage title was issued due to the damage to the side of the vehicle from a collision. Based on the information we have uncovered, we can infer the real reason behind the “Great Deal” we saw earlier at cars.com. The seller simply refurbished a salvage vehicle that was involved in an accident and was trying to sell it as used car. A refurbished salvage vehicle tends to have no resell value and often times comes with a lot of problems that may not have been properly rectified. Our Salvage Checker will help you avoid getting a bad deal. What if the car isn’t a salvage vehicle? If we couldn’t find a salvage record associated with the car, you will see the following result. While we try our best to gather as much salvage vehicles as possible, we may not cover all salvage vehicles in North America. We highly recommend you to check the VIN against National Motor Vehicle Title Information System (NMVTIS) database to be sure. After all, a small fee is nothing compared to buying a lemon car and spending lots of time and money fixing it. We hope this guide helped you understand how to perform a salvage title check using our Salvage Checker.